The Tampa Bay Lightning capped off its regular season just last weekend. Tampa Bay finished their regular season as the NHL-Best with 62 wins, earning them the Presidents Trophy. The 62 win season ties the 1995-96 Detroit Red Wings for most wins in a single regular season. That didn’t matter, as the Lightning let a three-goal lead slip in their Game 1 loss to Columbus, 4-3 in Tampa. 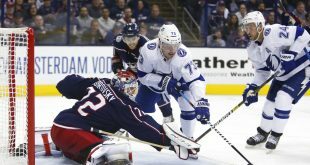 Game 1 of the Stanley Cup playoffs began last night as the Lightning hosted the Columbus Blue Jackets. 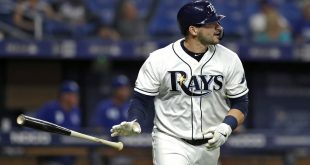 Tampa Bay had swept Columbus 3-0 in regular season games and it seemed as if they were about to do the same exact thing in Wednesday nights game. The Lightning jumped out to an early 3-0 lead in the first period and played like the best team in the league…at least for the first 20 minutes. Over the next two periods is when things started to get scary for the Tampa Bay. Columbus, who had to fight to even get a spot in the playoffs, slowly began to turn the game upside down. In the second frame the Blue Jackets scored a single goal to make the game 3-1. The Lightning began to scramble. Instead of playing their best defense, they attempted goal after goal with no luck. Lightning head coach, Jon Cooper, said that they need to be better about shutting teams down when playing with a lead. Nearly halfway into the third period the game was still locked in at 3-1 with the Bolts ahead. That was until the Blue Jackets David Savard deeked around Lightning defenseman Victor Hedman and scored to now make it a one goal game. It was just four minutes later that the Blue Jackets did the unthinkable and tied the game up against the best team in the league. Columbus was now on fire and not slowing down. Less than three minutes later the Blue Jackets capped off their rapid scoring and pinned the last nail in the coffin that was the Lightning. With just under 6 minutes left Columbus was now leading at 4-3. That lead would be all the Jackets needed to steal the opening game of the Stanley Cup playoffs. Not how we wanted to start this series. 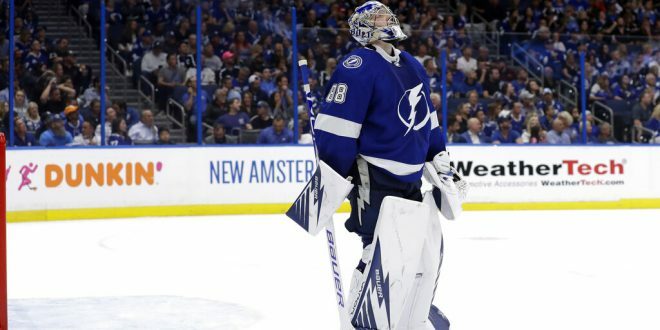 As a team who had outscored the Blue Jackets 17-3 and swept all 3 games of the regular season, the outcome was certainly not how the Bolts wanted the playoff series to begin. Tampa Bay will get another shot to even the score when they host Game 2 on Friday night.